I apologize for the posts being a bit scarce this past week, but life has thrown me a few curve balls. Sports, cupcake orders, and my daughter getting the stomach flu have really eaten up the time. As a matter of fact, I have another cupcake order that I am working on today, which doesn't leave me room for Sunday dinner baking for my family. Fortunately, I have a half batch of this cookie dough in the freezer from earlier this week to bake up for dessert tonight. 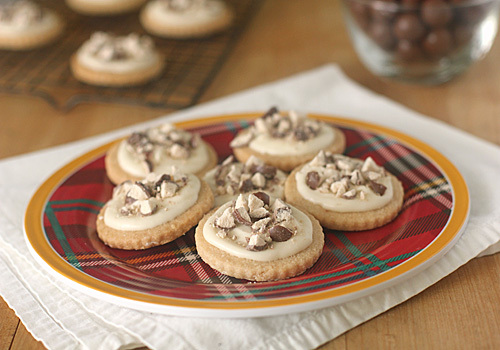 These malted milk shortbread cookies provide a nice little twist on the classic rolled out dough holiday cookie. You might have inferred from previous a recipe post that I am a Whopper fan. These crunchy little circles of yum deliver a malted milk/shortbread taste with a satisfying texture sure to delight any cookie lover. Preheat the oven to 325º F. Line baking sheets with parchment paper; set aside. In the bowl of a stand mixer fitted with the paddle attachment, beat the butter and sugar at medium speed until creamy. Add the flour, malted milk powder, salt, and vanilla, beating until combined (dough will be crumbly). Knead the dough on a work surface until it comes together, and pat it into a disk. Cover in plastic wrap and chill for 3 hours or until firm. On a lightly floured work surface, roll the dough to 1/4-inch thickness. Using a 2-inch round or fluted cookie cutter, cut out cookies. Using a spatula, transfer cookies to the prepared baking sheets. Gather scraps, re-roll, and cut out cookies until all the dough has been used. Bake the cookies for 20-30 minutes or until the edges are lightly browned. Transfer to wire racks to cool completely. In a medium bowl combine the sugar, cream, and vanilla, whisking until smooth. Spread the frosting on the cooled cookies and sprinkle with the chopped malted milk balls. Allow the frosting to set. Store in an airtight container for up to 3 days. Enjoy!